Suspended with iron catches. Helena has to endure the questions of the Inquisition. Thumbscrews and feet clamp should fasten her confession. She was tortured on garrote. 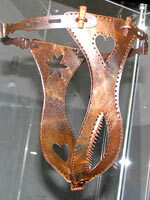 This torture device is a variation which was not used for executions, but to hold and choke a witch during interrogation. The victim was locked in position absolutely helpless, so the torturers could use other devices like pincers or a branding iron without being disturbed - This pics are from Inquisition World website, so you can find them in hi resolution there. Welcome to the world of Inquisition!